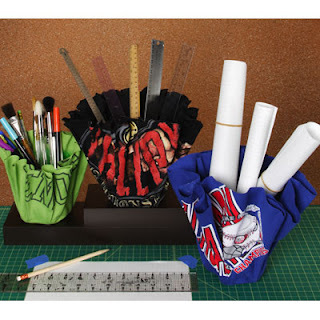 Take those old T-shirts you never wear anymore and turn them into something useful! These Fantastic Fabric Bowls are perfect for everything from parties to festive desk accessories; all you need are 2-liter bottles and Aleene’s® Crystal Clear Tacky Spray™ and Aleene’s® Stiffen-Quik Fabric Stiffening Spray! 1. Wash and dry 2-liter bottle. Use sharp scissors to cut off top from bottle then cut an even edge. 2. Cover cardboard with plastic wrap then place liter bottle top down in center. Cover with several sheets of plastic wrap, extending edges to hold in place. 3. Cut off front of shirt. Find a large bowl or make a circle pattern onto newspaper about 14" to 18" in diameter, depending on desired size of bowl. 4. Pin pattern onto shirt, making sure design is toward edge so it will show when formed. Cut edges around pattern so a circle is formed then remove pattern and pins. 5. Place fabric in baggie then spray Stiffen-Quik Fabric Stiffening Spray onto fabric until thoroughly saturated – the more liquid the stiffer it will become. Wearing gloves, pull fabric from baggie then drape over 2-liter bottle, centering in place and adjusting folds as shown. Spray on additional Stiffen-Quik if desired. Set aside to dry – this may take overnight depending on saturation and humidity. 6. Once dry, carefully remove stiffened fabric. Edges can be trimmed if needed. 7. Remove plastic from liter bottle then trim so it is about 5" tall. 8. Following label instructions, spray a small amount of Crystal Clear Tacky Spray™ inside bottom of fabric bowl then on outside of cut 2-liter bottle. Carefully insert 2-liter bottle into fabric bowl, pressing sides in place to secure. 9. Add a about an inch of pebbles, marbles or dry beans to weight container.